The Sater Design Collection currently has over 3,200 pins on our Pinterest boards! With 52 boards and more to come, it is our goal to share what our Pinterest followers want to see the most. When it comes to our luxury home plans, here is a Top 10 List of the house plan photos, floor plan, and blog post that have been ‘pinned’ the most. 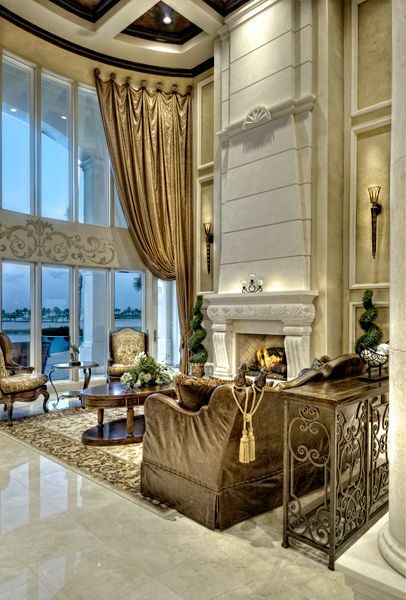 Our #1 pin of all time is the Great Room of the “Gabriella" home plan! The open floor plan, high coffered ceiling, view of the loft, and overall casual elegance of this great room makes this house plan a Sater Design best seller. 2. Foyer of the "Prairie Pine Court". With comments including “breathtaking” and “charming”, the popularity of this floor plan has made this our #1 best-selling house plan! 3. Outside Entry of the “Portofino”. This gorgeous Italian villa home plan is striking inside and out, starting with the lovely arched entryway welcoming you in. 4. Floor Plan of the “La Serena”. One look at this floor plan demonstrates the functionality, not to mention beauty, of this striking home design. 5. Dining Room of the “Padova”. This Spanish-Mediterranean style home plan features a barrel vaulted dining room with view of the stunning circular staircase. 6. Outdoor Living Spaces of the “Moderno”. Two outdoor living spaces flank the pool, one with an outdoor kitchen and one with a fireplace adjacent to the master retreat. 7. Living Room of the “Padova”. Again, the "Padova" shines. The two-story grand salon with stone fireplace overlooks the pool through a curved glass wall in this dramatic home plan. 8. Sater Design Blog – “5 Great Reasons to Build a New Home”. This article provides timeless information and is our most shared blog entry to date. 9. Front Elevation of the “Fiorentino”. This Mediterranean house plan with dramatic roof pitch changes and architectural enhancements create unmatched curb appeal. 10. The Gallery of the “Casa Bellisima”. 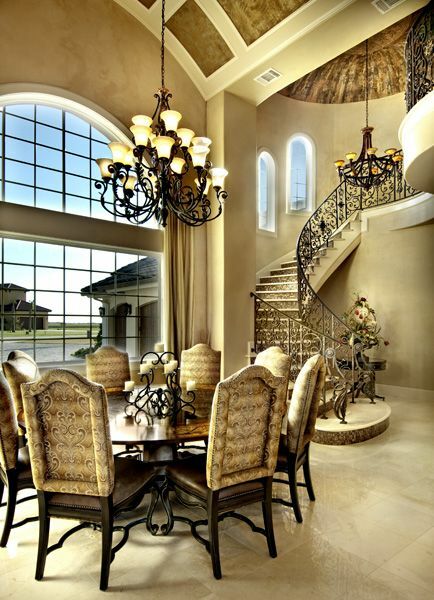 This luxurious estate home plan features a circular staircase with wrought-iron balusters, curving upward toward the magnificent ceiling detail and ornate chandelier. Did you see your favorites? If you're not already a follower on Pinterest, we invite you along for daily updates on home design, décor, and more! And as always, if a pre-drawn home plan or a custom home design is in your future, let us know how we at Sater Design can be of service to you.